As spring arrives, the cold of winter falls away, but for many, the change of weather doesn't take away the damaging effects of the winter on their skin. There are a variety of DIY beauty recipes to help battle dry, winter skin. 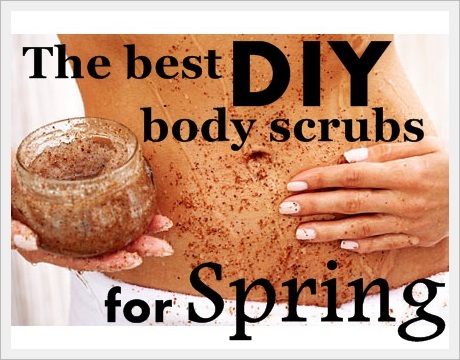 Exfoliation allows you to rejuvenate the skin, but DIY scrubs are some of the best ways that you can combat skin woes and save money. These are just a few of the home remedies that you can try. This exfoliating scrub is easy to make. All you need is sugar, ground cloves, rose petals, orange zest and sesame owl. To use this scrub, your skin has to be slightly damp. You should only scrub your skin twice a week with this sugar spice scrub. To mix, combine 3/4 cup of sugar, 2 teaspoons ground cloves, 2 teaspoons orange zest (grated), one tablespoon rose petals (dried) and 1 1/2 cups of sesame owl in a medium mixing bowl. Scrub with a hand towel or even your hands to shed away skin. You can also store this scrub in a cool place and reuse up to three months later. If you love honey, you probably have some hanging around your pantry. Honey is a perfect addition for a DIY scrub. Honey is a natural one to give moisture to your skin, but you can add in citrus and sugar to create a skin scrub. For this mixture, mix one cup of raw granulated sugar and two teaspoons of citrus zest with 1 teaspoon of honey and 1/4 cup of olive oil. You can store this scrub mixture in a sealable container and reuse. This scrub is the perfect remedy to make while at the beach. You'll need a jar with a seal to get started. With a dropper, blend 6 drops of orange, 4 drops jasmine oil and 1 cup of sea salt. Shake the jar up to get it mixed properly. Once mixed, pour the contents into a medium mixing bowl and combine with 4 tablespoons of olive or jojoba oil. The ingredient that you'll need from the beach is sand. Just add in about one handful of sand to this mixture. Swirl the ingredients around with a mixing spoon or your hands. As you sit out in the sun, scrub your skin with this DIY beach oil to remove roughness from your elbows, feet, legs and knees. Rinse off after to reveal your polished, glowing skin. This scrub is perfect for those who want an energizing scrub in the shower. Mix together 3/4 cup of Epsom salts, 4 drops of grapefruit oil, 1/4 cup baking soda and 1/2 cup or more of jojoba oil. You want the consistency to be like a paste as you apply to the body, so you can add more jojoba oil. Scrub your body down then rinse off in the shower. About the author: Michelle works for Skana, a spa in Upstate NY. She likes to share her beauty knowledge with women and provide tips and tricks to make them feel a sense of luxury right in their own home. Thanks for posting these! I love scrubs, especially for my face. Right now I am using one by sugared beauty. this makes me want to scrub scrub scrub....they all sound delic! Hope you are well girlie.